Having successfully made Chelsea-type buns a few times now, I thought I would have a go at my favourite - cinnamon rolls, displayed here on what Mr Z calls, "Moo - the chopping board." I used Paul Hollywood's bun recipe from his book, which is actually very similar to this recipe, only without the spices and a bit more yeast, which is probably why it rose like a mofo, in a very short space of time. I was worried about over-proving, but since I don't think I would know how an over-proved bun tasted different to a correctly-proved bun, it didn't seem like it would be an issue. The filling is utter sin. Three quarters of a cup of sugar (I used a mixture of light and dark soft brown sugar) and a generous tablespoon of cinnamon, mixed together in a bowl, and then sprinkled over the dough, which has been very generously basted with half a cup of melted butter. They are really good - I can recommend. Very light texture to the bun, and the filling is delicious. The only thing I might do is use unsalted butter next time. I think unsalted butter is Wrong, but these are on the salty side, I must admit, so perhaps I need to go with the Breton butter vibe next time. I actually finished this at the end of last week, but it has taken me a week to get the ends woven in, block it and get a daylight picture. I am very pleased with it. It didn't come out quite as I had imagined it, and I am a bit sorry the wave is not double height as I had planned it, but it is very warm and I really like how it looks. The fuzziness of the yarn adds to the blurriness of the waves which makes me think a bit of salt spray. I tried vertical bust darts for the first time in this one, and they worked very well, although I would probably have them a little higher if I was knitting it again. I might knit it again, but in a light yarn, so I can get more rows and thus taller waves. Perhaps if I get to go to Iceland again I can get myself some DK. 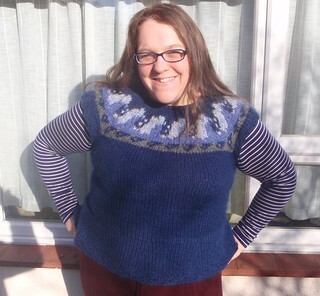 AND it used such a small amount of the yarn I had available that I have enough leftover for a second jumper. Result! It's OK, I haven't entirely eschewed blogging. I've been ill since NYE with a cough that began to affect my voice, so much so that I had to take a couple of days off work. This made me very annoyed because I had gone almost four years without a day off, but oh well. So, yeah, there's been that, which has just been sapping my energy, and then there's been the essay on assessment that was due last week (turning it in tomorrow, oops) which has been demanding what's left of my focus after coughing through a day at work, and then there's been Ofsted. They finally came. I am extremely grateful that they came (a) before half term and (b) during assessment week, when most of my books were already marked up to date. They saw me with year 11 and had no advice for me, which was nice, and lots of compliments about my outstanding assessment, which was even nicer. No idea about our overall grade yet but I am feeling fairly positive. Also, this was probably my easiest Ofsted so far - we weren't expected to produce lesson plans; all they wanted were annotated seating plans and to have a good look through our books. Back to the cough though, because it has annoyed me for another reason - it has got in the way of my planned attempt at a healthy January. I haven't really been able to exercise at all, so I have just had to console myself with browsing healthy salad recipes on Pinterest. I've been making salads in a jar for a year now and have finally built up a stash of five large pickle jars, so I can do a whole week's worth in one go. Until now I have had the same salad, every day, every week. I am a creature of habit, and I like salad. A lot. Then I discovered there were recipes all over Pinterest - and they looked really good. So, I have been trying new ones this month and this weekend I have made a couple up of my own. Here's the first one. In a small jar, combine 1 tbsp grated ginger, 1 tsp grated lemongrass, 2 tsp sesame oil, 2 tbsp soy sauce and a dash of water. Shake together until combined. Add a little more water as necessary. This is enough dressing for two salad jars. Grate a courgette on a coarse grater into longer strips (like noodles). Place on top of the dressing. Ad a handful of chopped mange tout. Combine 100g cooked black beans (Sainsbury's do these in a carton) with a chopped spring onion and a tbsp of pesto. I am obsessed with this pesto (don't click on that link if you're at work - Thug Kitchen likes the swears) so I used that. Thug Kitchen is right, this pesto and black beans works exceptionally well. Layer this on top of the veggies. 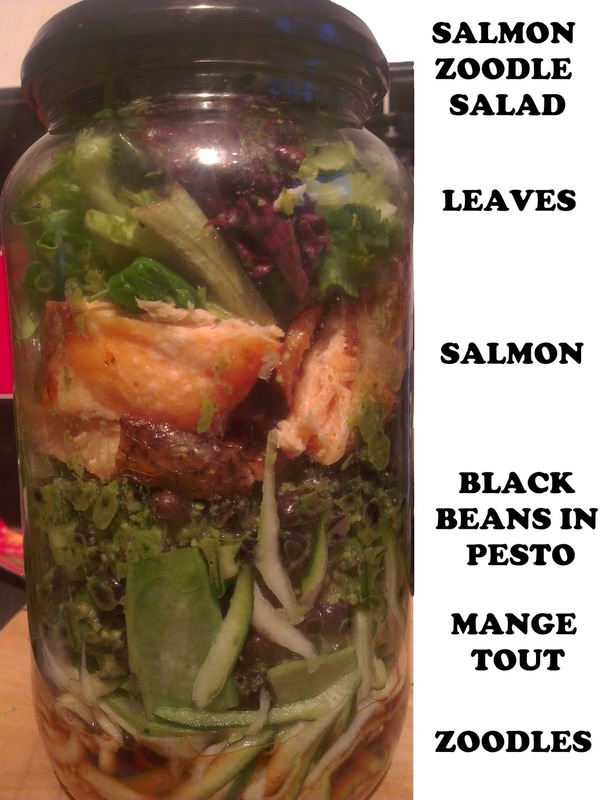 Add some chopped, cooked salmon, and some leaves.